This week I will be exploring the 4 voices (speaking, calling, whispering, and singing), and other vocal timbres, with my kindergarten classes. 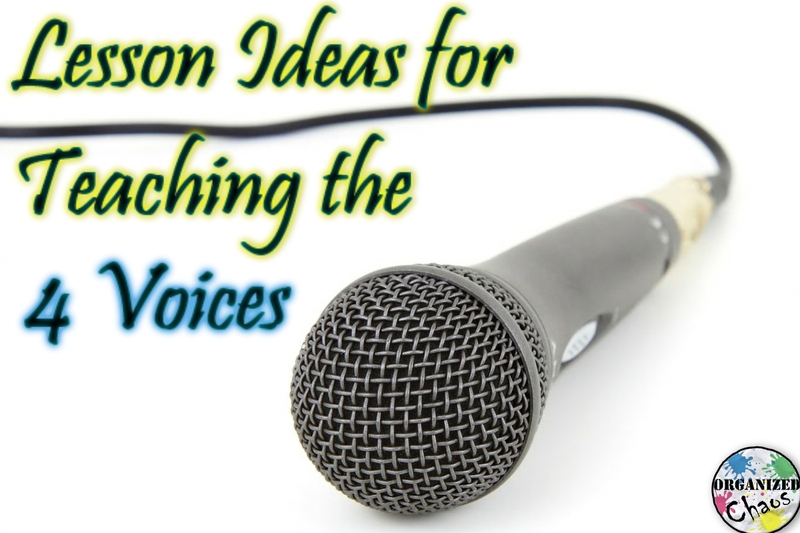 Today I thought I would share some of my favorite lesson activities to introduce and practice the 4 voices. Once the students know the song, I have everyone spread out around the room, sitting down on the floor. Everyone sings the song together, and after we sing "knocks me out", the students pretend that an apple knocked them out and lie down on the floor. I tell them the only thing that can wake them up is my singing voice. Then I repeat the song with all kinds of different voices, switching between voices mid-song. When the students hear my singing voice, they sit back up and sing with me until the end of the song. The first student to be sitting upright and singing with me at the correct time wins (and if they sit up too early they are out for that round). They love it because I do all kinds of silly voices, not just speaking and whispering, and I love it because they get lots of practice distinguishing the singing voice from other vocal timbres! There are tons of variations you can do with this one, obviously, and I usually come up with one or two new ones each year. My favorites, though, are "custodian style", which I do in the low voice of our school custodian (who is great and the students love him) and change the words to "broom chicka mop-a chicka", and "baby style", where I change the words to "poop chicka mama-chicka" (which pretty consistently makes everyone fall on the floor laughing). This is my calling voice - I use it to say "Hey!" *1st part of this line is sung on "sol", the last note is sung on "do"
What are your favorite ways to teach and explore vocal timbre with your students? Share your ideas in the comments! Yep, it was definitely a hit again this year! :) I wish I could remember where I got the idea from. I must have picked it up from another teacher, because I don't remember coming up with it myself.... In any case it is a lot of fun! These are great ideas! I'm working on this with my Kindergarten students right now. I can't wait to use these ideas in my classroom! I use the poem, but I've never used the second part of each line, so I will try that this year. And, I love the apple tree song (perfect for this time of year!). My students will really enjoy the game. Great blog post! "Boom Chicka Boom" is one of my all-time favorites from my childhood! :) I also love your idea for "Apple Tree." Thanks! I love your blog because I can almost always pluck your ideas and put them right into my lessons. I learned that version of Apple Tree from Ruth Dwyer, love it! We are doing the "five" voices ( in Texas we have "inner/thinking" voice, too) right now! I love the apple tree idea!!! I will totally use that next week! We also use "1 2 3 4 Meet me at the kitchen door. 5 6 7 8 hurry don't be late!" With each of the voice timbres! The kids love it, too! Love this! I will be using the poem and Apple Tree my first couple of weeks of class. Thanks Elizabeth! My kids go nuts for the Apple Tree game- hope your kids love it too! :) Have a great school year! Back to the Future: Giveaway and Sale! !